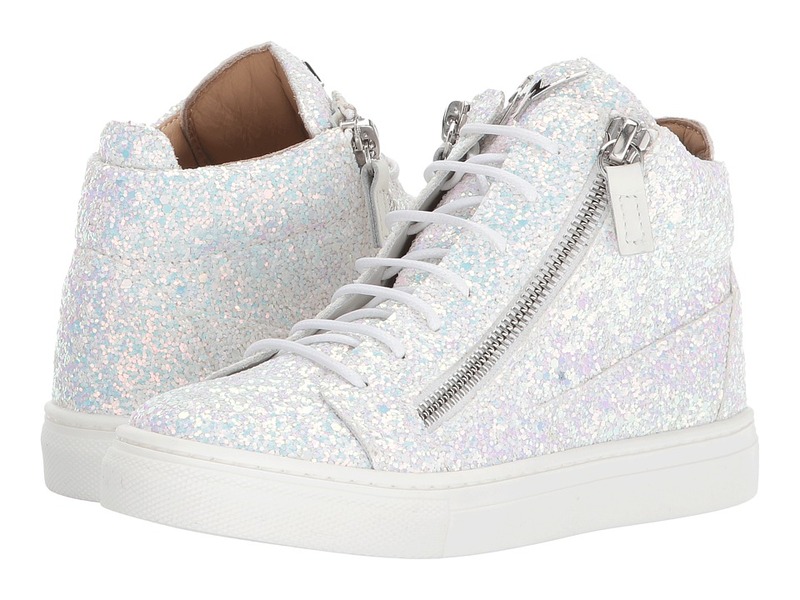 Let them shine bright in these Giuseppe Zanotti Kids London Sneaker. Iridescent glitter upper. Lace up design with invisible eyelets. Full side zip closure. Soft leather lining. Lightly padded leather insole. Rubber outsole. Imported. This item may ship with an attached security tag. Merchandise returned without the original security tag attached or a damaged tag may not qualify for a refund. Measurements: Weight: 9 oz Product measurements were taken using size 31 (US 13-13.5 Little Kid), width M. Please note that measurements may vary by size. Weight of footwear is based on a single item, not a pair. 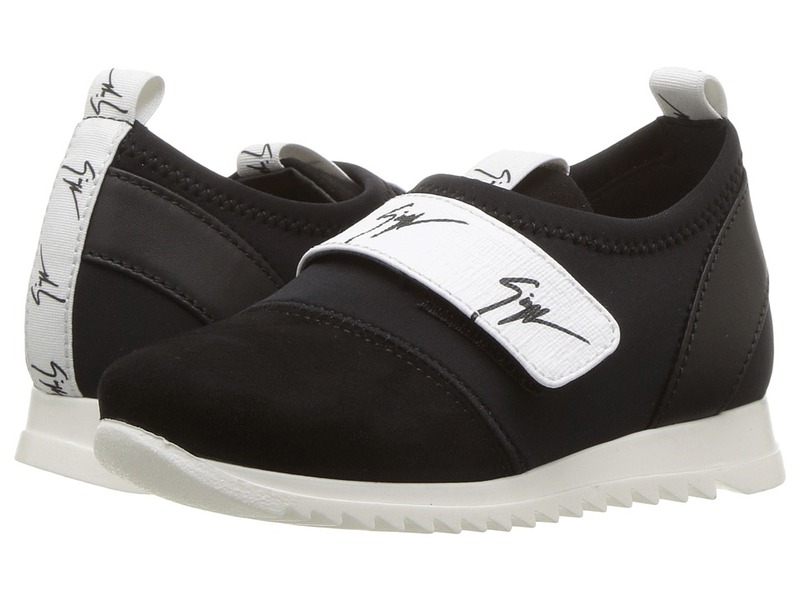 Let them stand tall in the Giuseppe Zanotti Kids London Sneaker. Smooth leather upper with camo canvas panels. Lace up design with invisible eyelets. Full side zip closure. Soft leather lining. Lightly padded leather insole. Rubber outsole. Imported. This item may ship with an attached security tag. Merchandise returned without the original security tag attached or a damaged tag may not qualify for a refund. Measurements: Weight: 6.4 oz Product measurements were taken using size 24 (US 8 Toddler), width M. Please note that measurements may vary by size. Weight of footwear is based on a single item, not a pair. 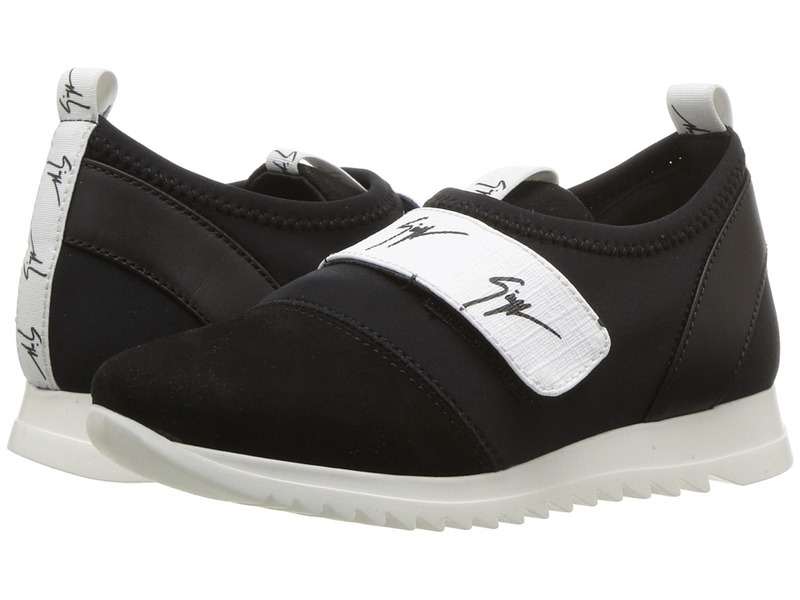 Let them shine bright in these Giuseppe Zanotti Kids London Sneaker. Camouflage upper. Lace up design with invisible eyelets. Full side zip closure. Soft leather lining. Lightly padded leather insole. Rubber outsole. Imported. This item may ship with an attached security tag. Merchandise returned without the original security tag attached or a damaged tag may not qualify for a refund. Measurements: Weight: 9 oz Product measurements were taken using size 31 (US 13-13.5 Little Kid), width M. Please note that measurements may vary by size. Weight of footwear is based on a single item, not a pair. 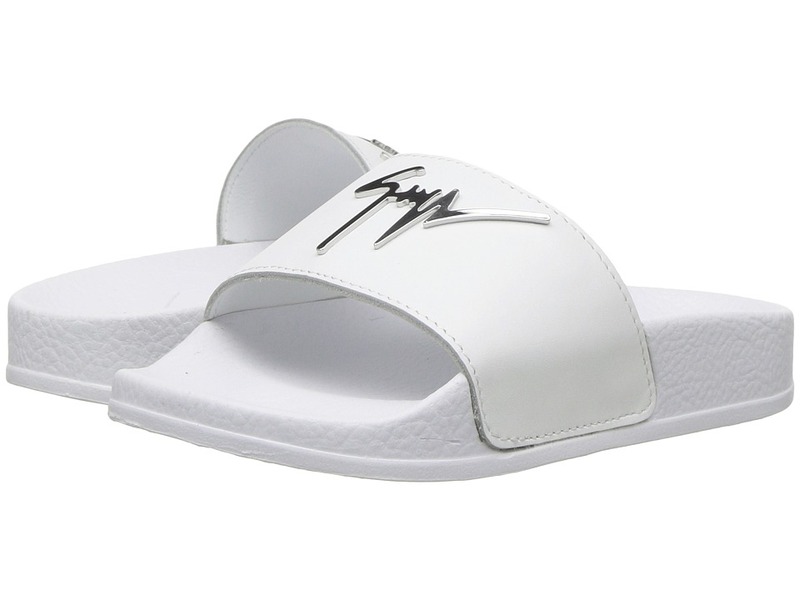 They~ll go the extra mile in stride wearing the Giuseppe Zanotti Kids Birel Slide. Open-toe, slide sandals. Branded, synthetic upper with brand signature. Synthetic lining and footbed. Synthetic outsole. Made in Italy. This item may ship with an attached security tag. Merchandise returned without the original security tag attached or a damaged tag may not qualify for a refund. Measurements: Weight: 3 oz Product measurements were taken using size 25-26 (US 9-9.5 Toddler), width M. Please note that measurements may vary by size. Weight of footwear is based on a single item, not a pair. 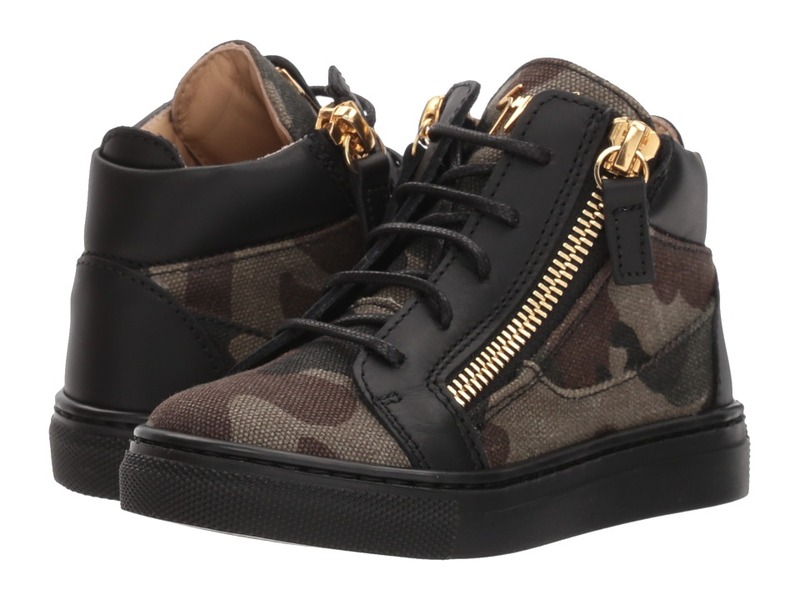 Set out for a fashion adventure wearing these Giuseppe Zanotti Kids Singles Sneakers. Suede leather upper. Hook and loop strap with iconic brand name at the vamp. Pull-on construction with pull-tab in back. Round-toe silhouette. Iconic brand name logo engraved in the center of tongue. Leather lining. Lightly padded leather insole with embossed logo. Durable rubber outsole. Made in Italy. This item may ship with an attached security tag. Merchandise returned without the original security tag attached or a damaged tag may not qualify for a refund. Measurements: Weight: 5 oz Product measurements were taken using size 24 (US 8 Toddler), width M. Please note that measurements may vary by size. Weight of footwear is based on a single item, not a pair. 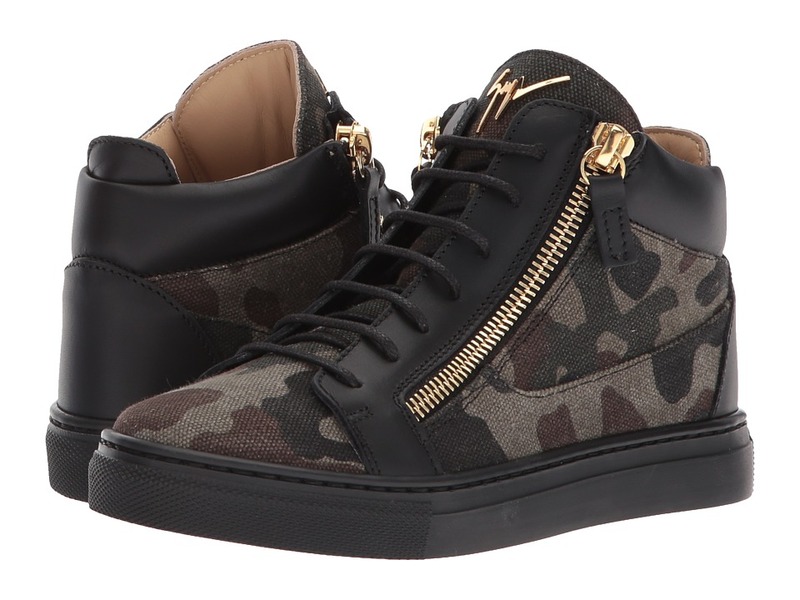 Set out for a fashion adventure wearing these Giuseppe Zanotti Kids Singles Sneakers. Suede leather upper. Hook and loop strap with iconic brand name at the vamp. Pull-on construction with pull-tab in back. Round-toe silhouette. Iconic brand name logo engraved in the center of tongue. Leather lining. Lightly padded leather insole with embossed logo. Durable rubber outsole. Made in Italy. This item may ship with an attached security tag. Merchandise returned without the original security tag attached or a damaged tag may not qualify for a refund. Measurements: Weight: 7 oz Product measurements were taken using size 29 (US 11.5 Little Kid), width M. Please note that measurements may vary by size. Weight of footwear is based on a single item, not a pair. She~ll twinkle bright wearing these Giuseppe Zanotti Kids Oldglitt. 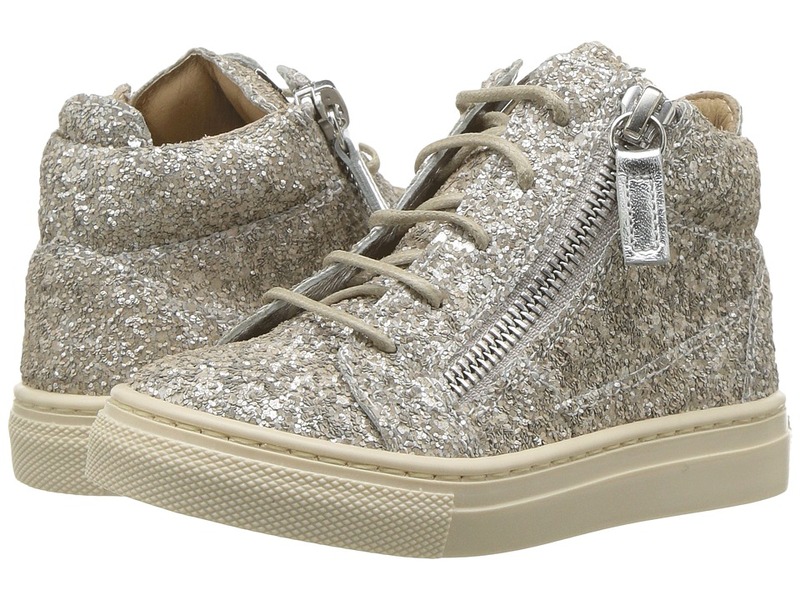 Dazzling, glitter upper. Lace and zip closure. Smooth leather lining. Cushioned leather insole. Rubber sole. Made in Italy. This item may ship with an attached security tag. Merchandise returned without the original security tag attached or a damaged tag may not qualify for a refund. Measurements: Weight: 6 oz Product measurements were taken using size 25 (US 8.5-9 Toddler), width M. Please note that measurements may vary by size. Weight of footwear is based on a single item, not a pair. 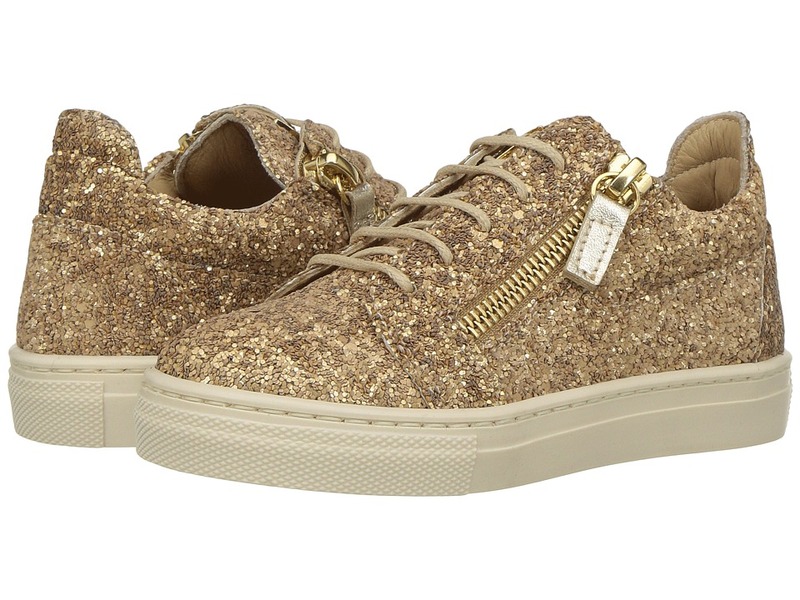 She~ll twinkle bright wearing these Giuseppe Zanotti Kids Oldglitt. Dazzling, glitter upper. Lace and zip closure. Smooth leather lining. Cushioned leather insole. Rubber sole. Made in Italy. This item may ship with an attached security tag. Merchandise returned without the original security tag attached or a damaged tag may not qualify for a refund. Measurements: Weight: 7 oz Product measurements were taken using size 26 (US 9.5 Toddler), width M. Please note that measurements may vary by size. Weight of footwear is based on a single item, not a pair. She~ll twinkle bright wearing these Giuseppe Zanotti Kids Oldglitt. Dazzling, glitter upper. Lace and zip closure. Smooth leather lining. Cushioned leather insole. Rubber sole. Made in Italy. This item may ship with an attached security tag. Merchandise returned without the original security tag attached or a damaged tag may not qualify for a refund. Measurements: Weight: 5 oz Product measurements were taken using size 24 (US 8 Toddler), width M. Please note that measurements may vary by size. Weight of footwear is based on a single item, not a pair.